PCH provides breakfast to parents staying overnight but does not supply additional meals, snacks or beverages unless you are a breastfeeding mother. We also recommend that patients only eat and drink the food provided by the hospital and not anything that is brought in from home or other places. Please read the Bringing food into the hospital brochure on our website for more information. PCH has a number of on-site healthy food services and places to eat including the Food Hall on Level 1, Supernatural on Level 5 as well as Little Lion Coffee and vending machines located on Ground Level. The Perth Children’s Hospital Foundation Gift Shop is open from 8am to 4pm, Monday to Friday and is the place for grab and go items such as newspapers, magazines, gifts, cards, stamps and confectionery. Located on Ground Level, proceeds from the gift shop go back into the hospital to fund vital research, staff, equipment and services. If friends or family would like to purchase a gift or toy for a loved one at PCH, the Foundation can arrange for something to be delivered directly to their room. Deliveries can be arranged by visiting the gift shop or by visiting the Foundation’s online shop at www.pchf.org.au. 8am - 6pm weekdays, 10am - 2pm weekends. Little Lion Coffee offers a wide range of healthy snacks and coffee. As supporters of Perth Children’s Hospital Foundation, part of every dollar you spend at Little Lion Coffee, goes back into PCH. 6.30am - 5.30pm, 7 days a week. There are vending machines located in the Emergency Department offering fresh and re-heatable healthy food and snacks as well as a selection of drinks. 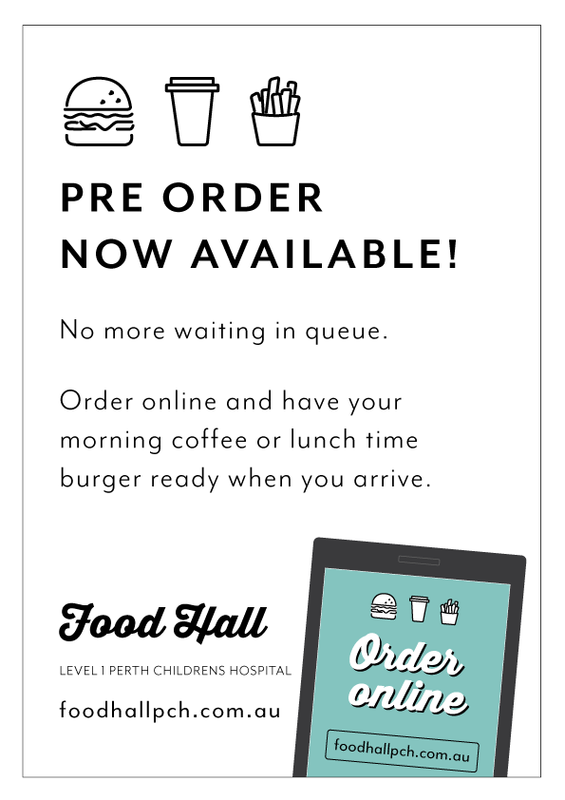 You can pre-order online from all the retailers in the Food Hall - no more waiting in the queue for your coffee or meal. Visit pchfoodhall.com.au for more details. 6.30am - 7pm, weekdays and 6.30am - 5.30pm weekends. Sushi, rice paper rolls, noodles, rice. The menu changes daily depending on the produce that is on hand but you're always bound to find something delicious! Burgers, fries (that aren't fried) and shakes. House made from scratch using the best ingredients. Café open all day with their own roasted coffee, fresh salads, wholesome soups, hand made sandwiches and all day brunch.